I had the opportunity to work with Brian Tracy (yes, THE Brian Tracy) and a select group of leading business experts from around the world to co-write the book titled, The Winning Way: The World’s Leading Entrepreneurs and Professionals Share How They are Winning in Life and Business and You Can Too! The book was released on June 19, 2014, and reached best-seller status on Amazon.com that very same day! As a trader and founder of Certus Trading, I am very excited about The Winning Way because I get to write about my trading success story. More importantly, as an entrepreneur, I am very proud to share with the world how I found my winning way from having a goal, a desire to achieve it, and the qualities of discipline, perseverance and action to attain it. In The Winning Way, I reveal the Three Psychological Mindsets You Must Have To Beat Wall Street. I will also give you tips on how to acquire these winning mindsets. If you want to become a consistent and profitable trader, this is a must read. 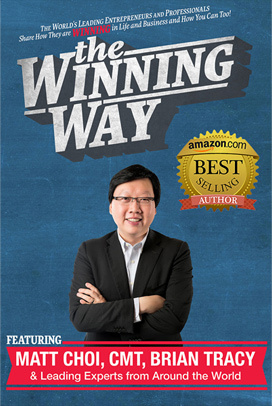 You can get my free limited edition of The Winning Way (with my custom book cover) here. If you prefer to buy the standard edition with Brian Tracy’s on the book cover, you can get it on Amazon here. Please note that all authors in The Winning Way have agreed to donate our royalties to the Entrepreneur’s International Foundation, a not for profit organization dedicated to creating unique launch campaigns to raise money and awareness for charitable causes.